Category of use grade 3 according to EN 1906. 5-year warranty. With adapter ring between lever handle and rose or backplate. Pure door furniture is available in satin-finished (matt) stainless steel or F1 aluminum. The range of models available meets standard market requirements. The quality of the surface corresponds to the standard applicable in this market segment. Pure door fittings are supplied as complete sets with springing already fitted. Attractive designThe DORMA Pure range comes in an attractive design of functional quality. Fittings are characterized by their proven technology and operational reliability. High-quality materialsThe fittings are manufactured from high-quality materials and exude careful workmanship. DORMA Pure meets high demands with respect to resilience, reliability and corrosion resistance. Quality at an attractive priceThe Pure range encompasses the most common lever handle models. 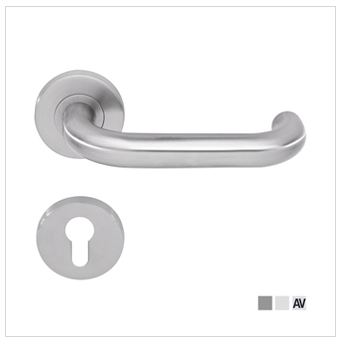 Hardware sets from the Pure range are good quality door furniture at an attractive price. Available as complete sets for timber doors and as half sets for narrow stile doors. With integral springingAll models are provided with an RH or LH spring in order to return the lever handle to the horizontal. Available in satin-finished (matt) stainless steel or aluminumIrrespective of which material you choose, with DORMA Pure you are opting for a door furniture solution of contemporary elegance. The choice and quality of the surfaces satisfy the requirements for standard applications, whether in the private sphere or for interior doors in office buildings.